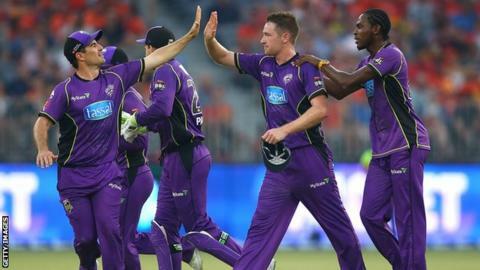 Hobart Hurricanes beat holders Perth Scorchers by 71 runs to reach their second Big Bash League final. Matthew Wade led the Hurricanes with 71 in Perth and Ben McDermott was 67 not out as the visitors finished on 210-4. Seamer Tom Rogers (3-31) then removed the Scorchers' top three inside six overs before Dan Christian claimed 4-17 to bowl the Scorchers out for 139. Yorkshire all-rounder Tim Bresnan starred for the Scorchers, taking 2-40 before hitting 43 as they fell short. The former England Test player, 32, took the wickets of George Bailey (17) and opener Wade before Christian was run out for 37 from the penultimate ball of the Hurricanes' innings. Sussex all-rounder Jofra Archer has caught the eye for Hobart in this season's competition after being a late replacement for England's Tom Curran, but this time the Barbados-born seamer - who will qualify to play for England by residence in 2022 - was outshone by Rogers and Christian. The Scorchers, who have won the Big Bash three times in the last four years, rallied with Bresnan's knock but he had little support from the tail. Hobart will play either Adelaide Strikers or Melbourne Renegades in the final on 4 February. They face each other in the second semi-final at Adelaide Oval on Friday. Before that game, the Strikers will face Sydney Sixers for a place in the Women's Big Bash League final alongside Perth Scorchers, who beat Sydney Thunder by 27 runs in the first semi-final in Perth. You can listen to commentary on the men's and women's Big Bash semi-finals and finals on BBC Radio 5 live sports extra, the BBC Sport website and app.